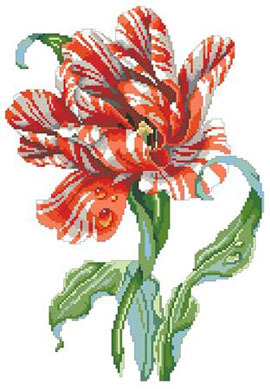 A magnificent red and white Striped Parrot Tulip is the center piece of this design by our own Barbara Baatz-Hillman. It would make a lovely companion piece to the Rose Beauty chart also by the same artist. Contents: Stitch Count 124w X 180h Finished Size on 14ct: 9" x 13"